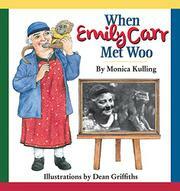 A picture book offers glimpses of the life of the iconic Canadian artist Emily Carr. Although Emily Carr deserves to be as ubiquitously known in the United States as she is in Canada, this book is probably not going to help that happen. Any appeal it may have relies on prior knowledge readers might have of Carr’s life; the brief biography on the last page is not enough. To readers unfamiliar with Carr’s art and writing, it becomes only the story of an eccentric old woman who occasionally paints, makes bowls, hooks rugs and has a houseful of animals, including a monkey that gets into mischief. As much as the narrative fragments try to center around Carr’s relationship with her pet monkey, Woo, they do not coalesce into a cohesive story, needing far more background information than presented to create resonance. The illustrations are another casualty of this assumption of prior knowledge. But in this case, the misjudgment is in assuming that readers need to know what Carr looked like. Instead of imbuing his illustrations with vitality and originality, Griffiths has limited them to a pseudo-realism that, while succeeding in capturing a comic-book–type likeness of the real Carr, ultimately comes across as staid and stilted.